located in the heart of the Ojai Valley, 20 miles inland from Ventura, and 100 miles north of Los Angeles, is a locally owned independent business services store providing copying, shipping, mailbox, graphic design, faxing, notary services and document processing. 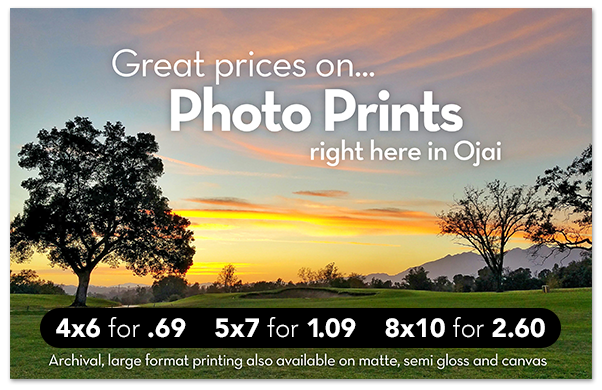 We are the only store of our kind in the Ojai Valley. Ask Ethan or Josh for graphic design services, Jesse or Sam for shipping services, and Austin or Justina for Document Services. Located at 226 W Ojai Avenue (Highway 150), on Ojai's main street, in the new shopping center opposite Carrows and Bank of America. The center is 2 blocks west of the traffic signal in downtown Ojai on the north (mountain) side of Ojai Avenue. Parking is available behind the center off either Matilija or Blanche Street. We offer top notch Graphic Design from our in house designer Ethan. If you are looking to get a business card, flier or anything else designed, stop in and ask for him.